How would you like to wake up each morning and decide if you want to walk to the Market Common shopping and dining district or golf cart to the beach? 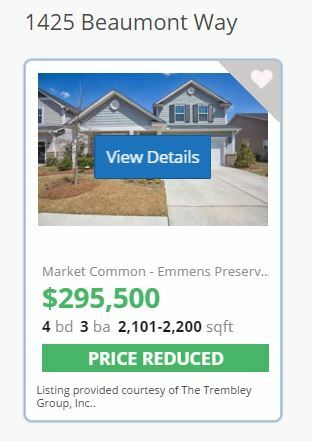 Before giving you the low-down on this amazing home, just a quick reminder that you can learn more about this featured property, as well as thousands of other homes currently on the market on the Grand Strand, by visiting the Search Page here on our website. We’d love to answer any questions you may have about Grand Strand real estate. Just give us a ring at 843.638.3002 or follow us on Facebook or Instagram to learn more. To learn more about Market Common, watch our Market Common Community Video. For all communities videos, click here: YouTube! The possibilities are endless for your ideal lifestyle in this is fantastic, well-maintained home in Emmens Preserve. This Crepe Myrtle floor plan has many upgrades such as hardwoods, a fireplace, solar tubes for extra sunlight, gas appliances a spacious back yard with outdoor entertainment area and garden. The bedrooms are roomy and spacious with high ceilings. This lovely backyard is waiting for you! What a beautiful garden! It’s easy to plan your own private tour of this extraordinary home. Just call The Trembley Group today at 843.638.3002 and schedule your visit with one of our licensed agents.